The question of how to respond to events beyond our control, the broader events and decisions that continue shape the world, is an important one. So much destructive and exploitative human activity is taking place (fracking, mountain top mining, tar sands oil) and its hard to respond when we feel so powerless. Its even harder to respond when we know that we are complicit in these events’ creation–by driving cars, heating our homes with gas, and so on, we are shaping the events that take place. The kinds of responses we generate in the face of such events is an issue well worth pursuing. Each area has its own local challenges, my area being no exception. As I’ve discussed on this blog before, the area in South-East Michigan where I live (less than 3 miles north of my house) has a tar sands oil pipeline being put in (this line is an alternative to Keystone XL, which has generated substantial attention in the media). 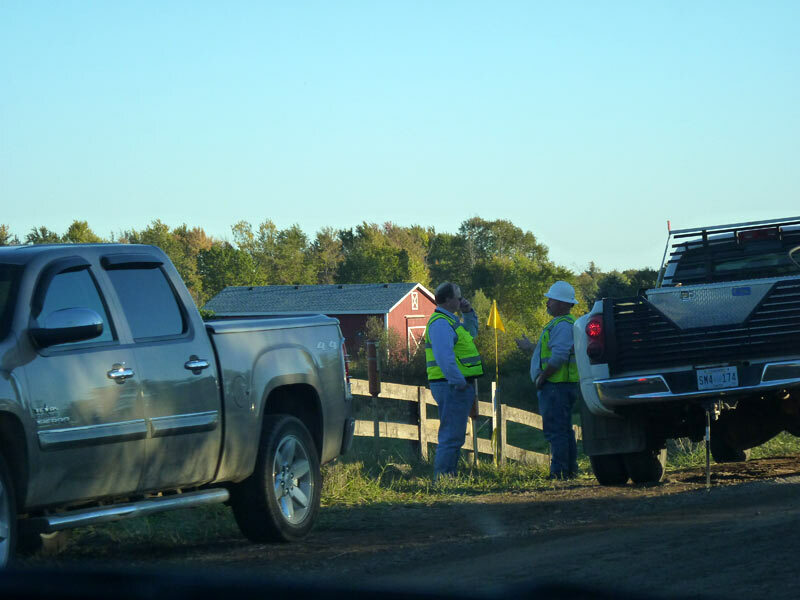 While there is nothing that the citizens can do here to prevent the pipeline from being completed due to the history of this particular pipeline and previous permission being granted, we can certainly decide how we respond, how we work with the land, and what we do after the pipeline crews leave. How we choose to respond can shape conversations about these activities for decades to come, and can demonstrate that there are many ways to work with the land and address change. Last fall, I discussed the Enbridge Oil Pipeline digging project that was going through my good friend Deanne’s land at Strawbale Studio. 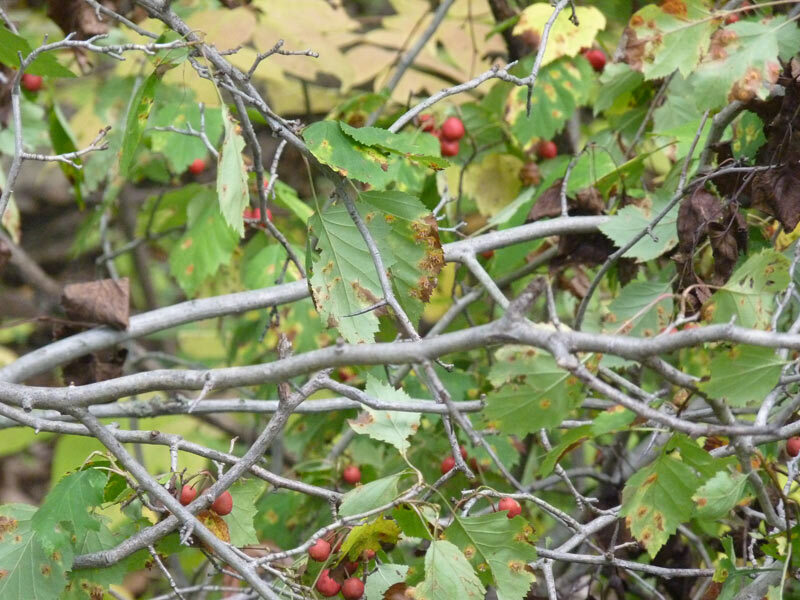 In the fall, I went and worked with the trees and documented what was happening on her land. 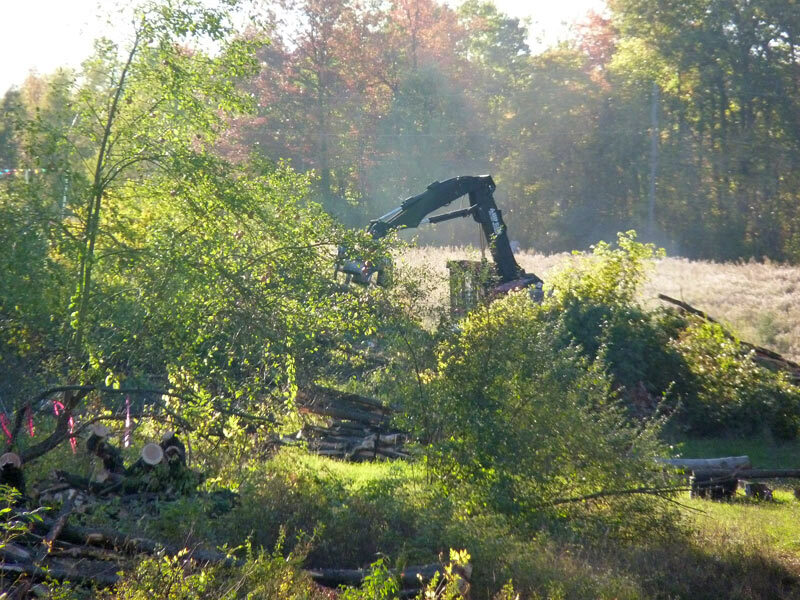 At this point, the land has been cleared for the crews, and the pipeline will be dug within the next few weeks. Those of us involved with Strawbale Studio been thinking about what to do when the crews leave, how we might encourage sustainable thinking and practices. 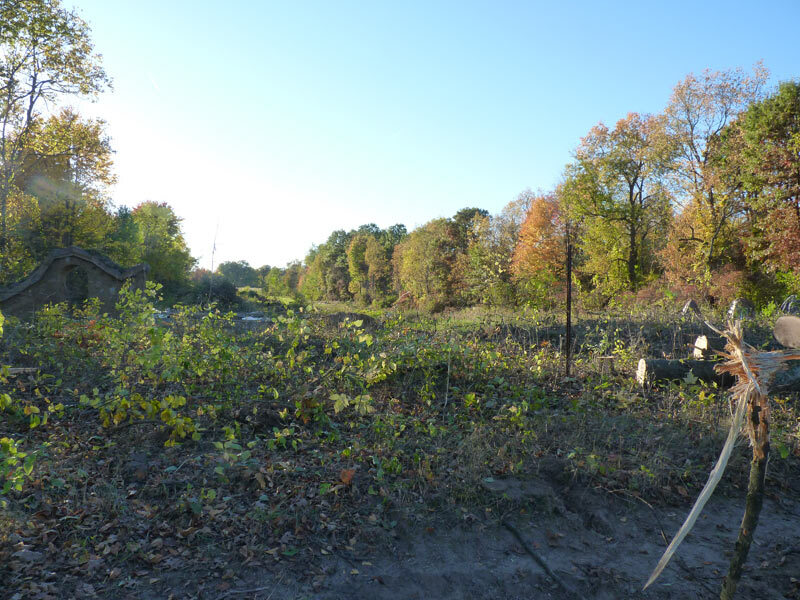 Last night, 35 members of the Oakland County Permaculture Meetup spent time looking at the site in its current form and brainstorming ideas for restoration once the pipeline project is done. I wanted to post an update about some of our ideas and suggestions to A) document the progress of this project and our response and B) share the ideas if others are facing a similar challenge in their communities. 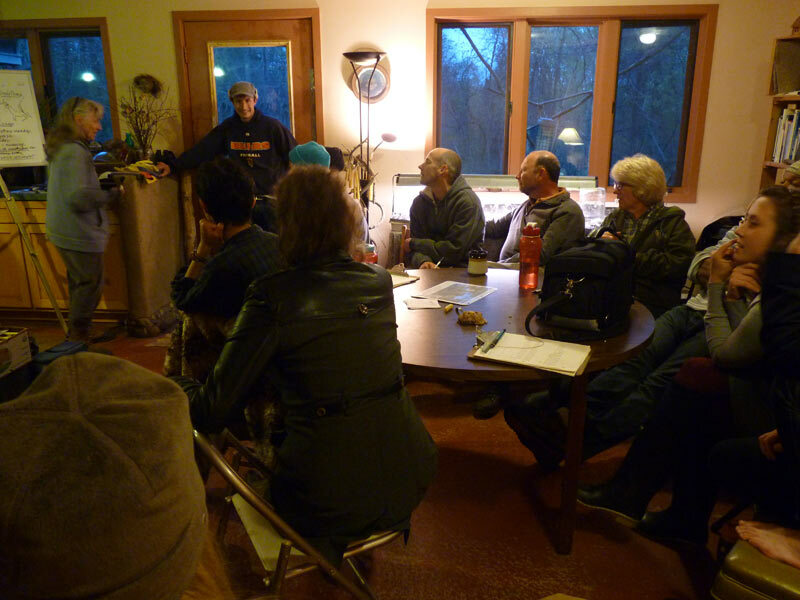 We began with a tour of the Strawbale Studio property, ending at the pipeline. 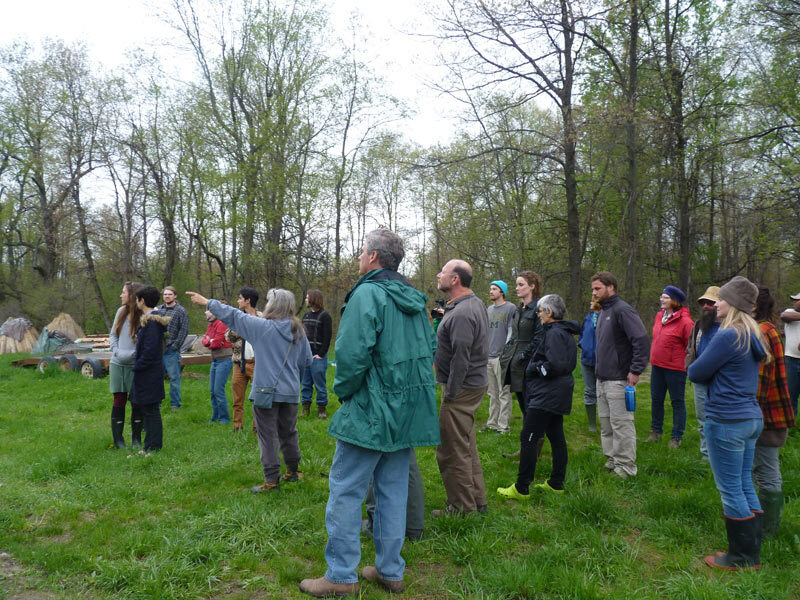 Using principles of permaculture design (observe and interact) we examined the site, explored the margins, noted the existing flows of energy (like a wetland area on the western part of the pipeline and a rising slope on the eastern part of the pipeline). 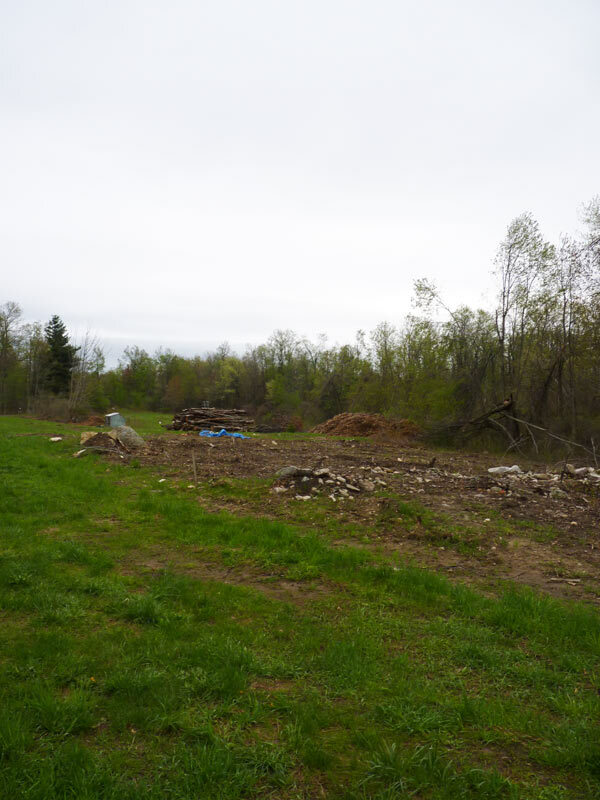 Deanne also pointed out the existing resources, including a huge pile of mulched wood chips from the trees that were cut (which will likely become a compost water heater in the fall) and numerous logs and stone piles which could be used for various natural building projects. After reviewing the site, we went back to the house for discussion about possibilities. We also noted the distance from the house (about a 3-5 min walk) and noted the severity of last winter would mean that the site might not be accessible year round. 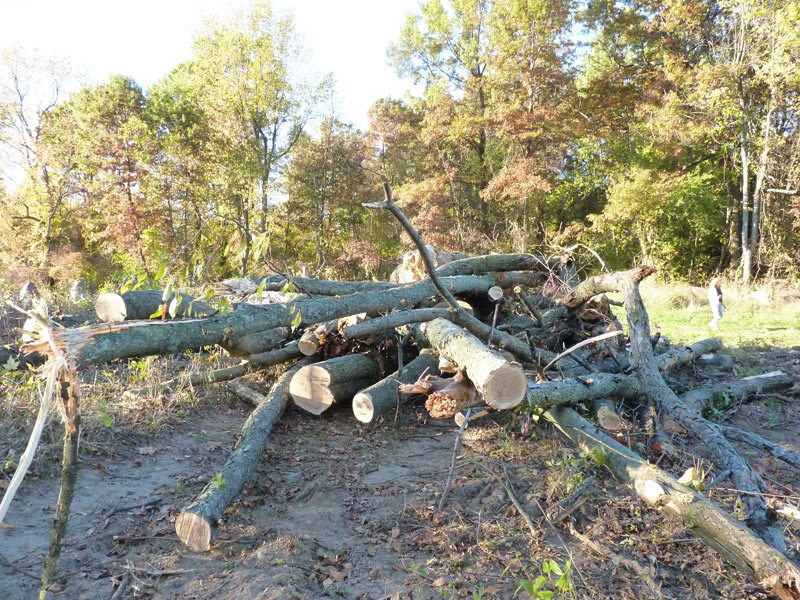 We also noted which areas needed to remain clear of large trees (where the pipeline is) and which areas could be “anything goes” areas (the staging areas where they cleared to have their equipment move in and out around the area where the pipeline is being dug). Its incredible what happens when you get 35 people in a room who want to make change. We came up with a number of good and worthy suggestions–short term and long term. I’m not sure yet which ones we’ll decide to move forward with, but I think a number of these are worthy of consideration. 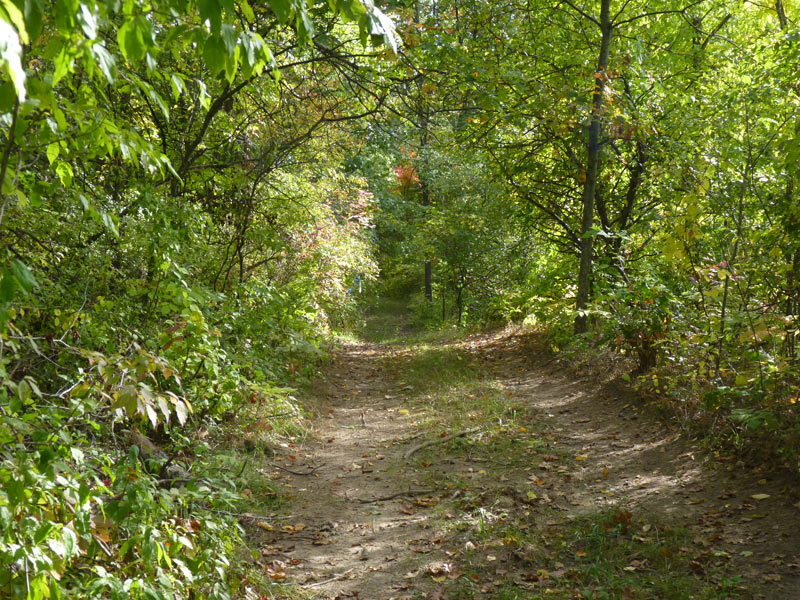 Seeing what kinds of resources for restoration the company offers (they are required to offer some, based on Michigan Department of Natural Resources and EPA guidelines). Once the crews leave, we need to immediately get something immediately planted in the bare soil to help restore the land and rebuild the soil ecology. Ideas ranged from a cover crop of rye, clover, alfalfa to something with a tap root. This suggestion is particularly important because the soil ecology has been largely destroyed and now the soil will have substantial amounts of compaction due to the heavy machinery going over the site. A tap rooted crop will help break up compaction and add nitrogen and other minerals back into the soil. These three areas are the first we will address in the action plan. Once we see what resources we have, what, if anything, we can do to shape the land, and how to get something in the soil to restore it, the longer-term projects can get underway. The long-term projects ranged substantially, and many have a lot of merit! Which projects end up taking place depends on the community, the resources, and Deanne’s vision for the site. A camping area (perhaps combined with a yearly gathering) where interns or visitors can camp. 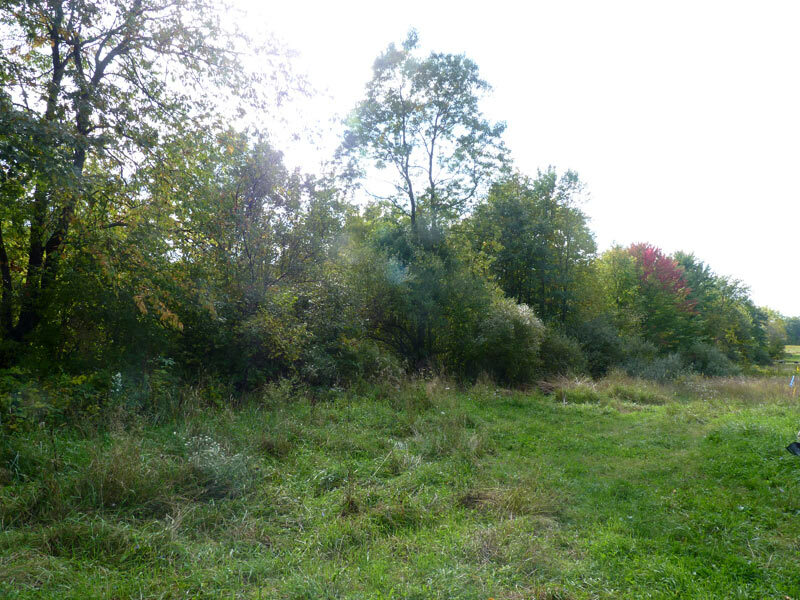 A pollinator sanctuary with native wild grasses, plants, flowers, etc., as well as beehives for honey and a cob beehive for wild bees (like mason bees). 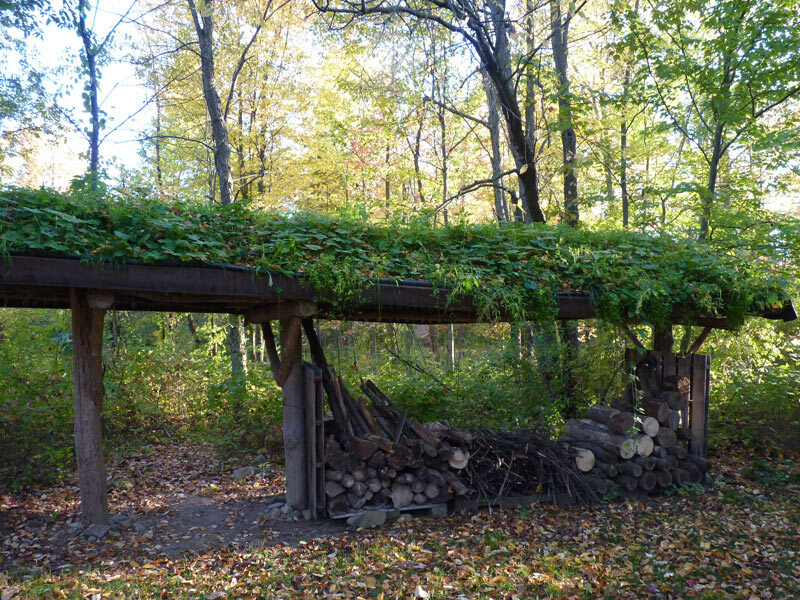 We like this idea a lot because it doesn’t require a lot of daily maintenance (like animals would, see below), and it contributes back to the land. Some kind of co-op: wine/grapes, orchard/fruit; goat/sheep; chicken/egg; or herbs. The idea is that the community would contribute to the work of the co-op and reap some of the rewards. These are just some of the ideas the community came up with. This was a wonderful meeting, to see so many people invested in planning for the future, in reclaiming the land and in working to put something in that encourages a different worldview. Throughout our country and world, there are a lot of bad things being done to the land in pursuit of cheap fossil fuel energy. Any of us who participates in modern consumerist society (myself included) is contributing to the problem of the exploitation of our lands for oil. And most of us live near some kind of activity–from mountaintop removal to fracking to oil pipelines (and many of us live in areas were multiple kinds of activity are taking place). While we can reduce our fossil fuel use and look for alternatives (as many of us are doing), how we respond to these kinds of issues, especially when we are directly confronted with them can empower us and bring about broader change in the world. That we will turn the oil pipeline site into a sustainable, model site for other kind of restorative work is empowering–and its something we *have* the power to do, while stopping the oil pipeline is something that we really don’t have the power to do (this one was leased in the 1960’s, so its a done deal as far as any of us can tell). I’d be interested in hearing of any other communities’ responses to these kinds of issues. As I’ve discussed a few times on this blog, we have an oil pipeline going through our immediate area in South East Michigan. 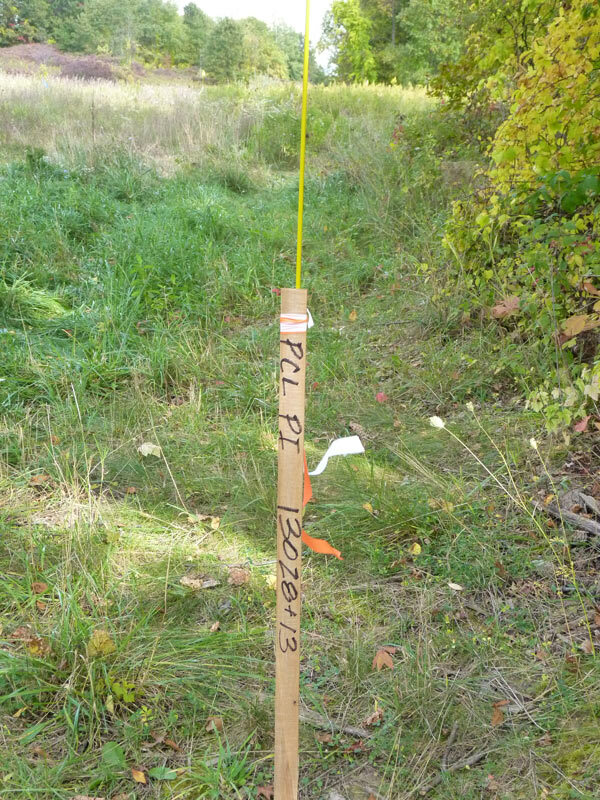 The first “phase” of the project went 1/2 mile north of my home in 2012-2013. This was “Line 6B, phase I” according to Enbridge’s site, and was an upgrade/replacement project for one that they originally put in in the 1960’s to send oil from Canada to refineries in Michigan, Ohio, and Indiana. The 2nd phase of the project began a few months ago and will continue into 2013-2014; it will create a new, much higher volume pipeline and decommission the old pipeline currently in that area. One of my goals with this blog, as I have done in the past, is to document such issues and their spiritual and environmental consequences (and long-term readers might recall my coverage of some North Dakota fracking last year). I’m going to start with an overview about the larger oil pipeline and some environmental consequences–then I’ll get into details about how its affecting one local place, Strawbale Studio. I also have mentioned in an earlier post that this same pipeline was responsible for the Kalamazoo Oil spill in 2010, which put somewhere around 1 million gallons of oil into the Kalamzoo river. The pipeline spill is still not entirely cleaned up and just a few months ago the EPA ordered Enbridge back to clean up more of the oil still in the river and surrounding areas. 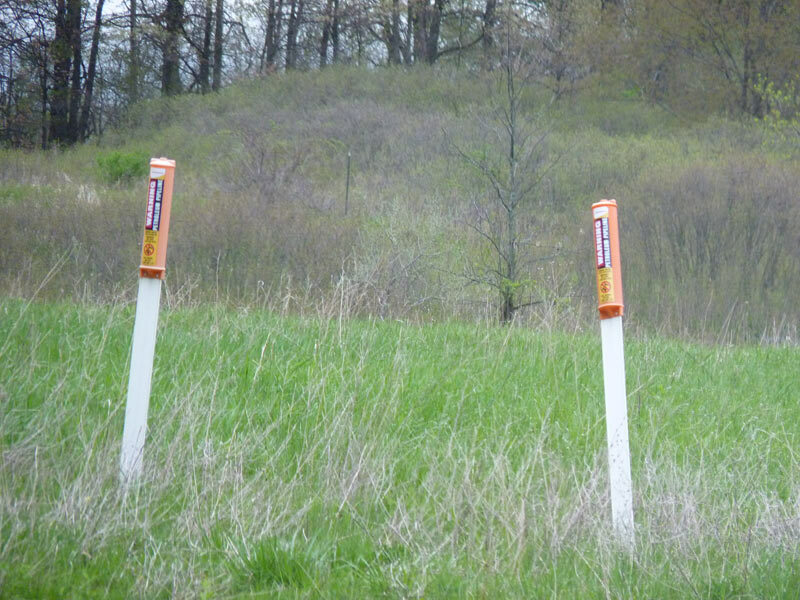 Given Enbridge’s history of environmental ethics in this state, the fact that they are making a larger volume pipeline now is particularly concerning. One of my colleagues, who has the Line 6B coming through his property on my road, has been blogging about a lot of this at his Line 6B Blog. Also of concern is the source of the oil–the Alberta (Canada) oil sands. This oil sands methods of extraction are particularly damaging to the peat bogs and boreal forests that make up much of Alberta. Water usage, and the release of oil-tainted water, very harmful to wildlife, occurs with tar sands oil extraction. Substantial carbon dioxide emissions are also on the rise (which have increased Canada’s emissions in the last 20 years rather than decreasing them, as per the Kyoto Protocol). In all, these oil sands, and the resulting pipelines, represent serious environmental and ethical challenges. Going after tar sands oil is an indicator of the fact that oil is a finite and quickly depleting resource, past its peak of production. Companies wouldn’t have considered mining these patches for oil years ago when other oil fields were still easy to access and full of oil. These tar sands oil fields are now mined, despite their environmental consequences, because few other options exist to keep oil flowing at the rate of demand. The energy returned on investment (EROI) on tar sands oil is somewhere between 2.9 to 5.1 by more liberal estimates (so for every 1 energy unit we put into the process of mining, we extract 2.9-5.1 units of oil). (Some have suggested its closer to 1:1 if one considers the whole lifecycle of the production of tar sands oil, and things like the upkeep of pipelines). Compare this to conventional oil fields, which today offer a 25:1 EROI (fields of years past offered much higher EROI). In other words, this tar sands oil cruising through pipelines in South East Michigan isn’t even worth much investing in from an EROI, even if one were to overlook the substantial environmental impacts. 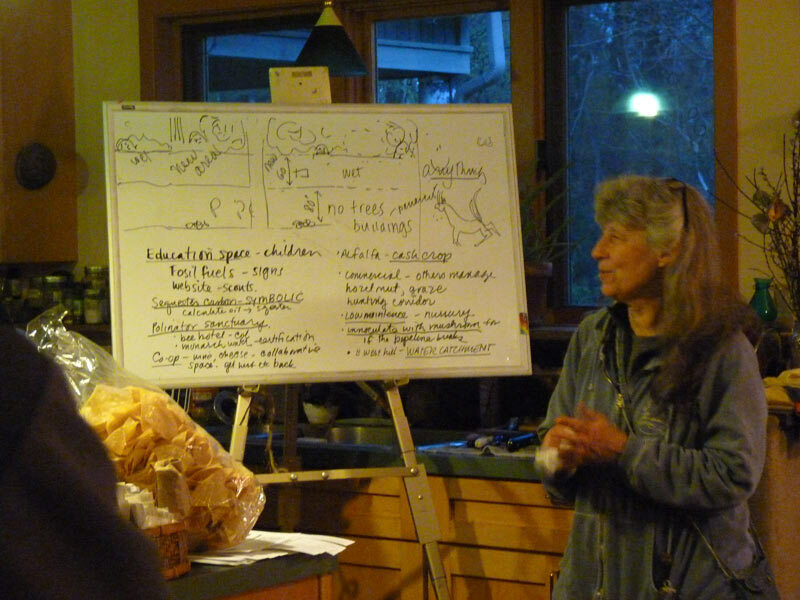 Strawbale Studio in the path…..Back to the matter at hand. Endbridge is now moving onto their 2nd phase of the pipeline project, and this is very unfortunately intersecting with a place near and dear to my heart–Strawbale Studio and Sustainable Living Center (run by Deanne Bednar). Strawbale Studio is a place that, from a sustainability perspective, is doing everything right: teaching and empowering people who want to learn how to live more sustainably, building community, and sharing skills. 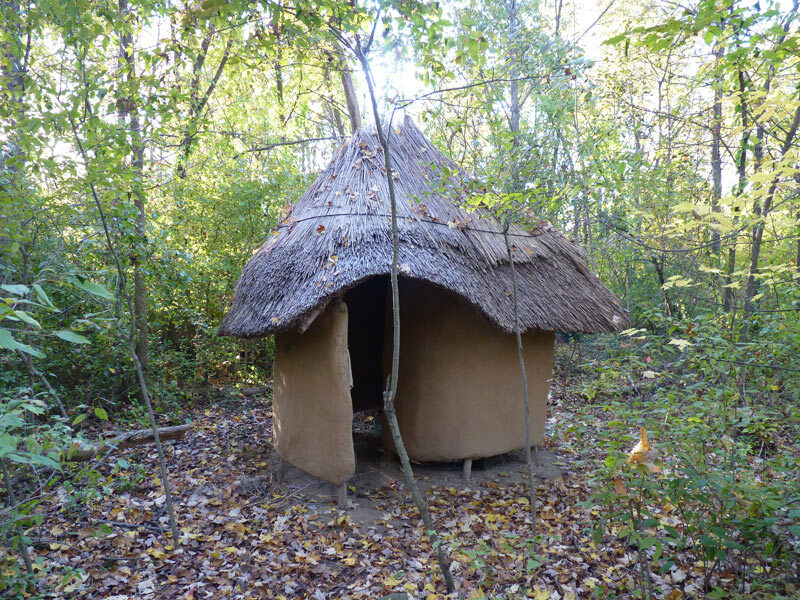 I’ve been honored to take numerous workshops there and have learned a great deal of information on more sustainable living skills, such as cob building and artwork, strawbale construction and natural building, growing mushrooms, barn raising, rocket stoves, composting, food preservation, candle making, and so much more. I’ve also been excited to meet so many people from around the world who are interning or taking classes at Strawbale Studio. On the back part of the Strawbale Studio property spans the old oil pipeline that Enbridge built in the 1960’s; now they are decommissioning the old line and destroying more land for their larger, new pipeline. 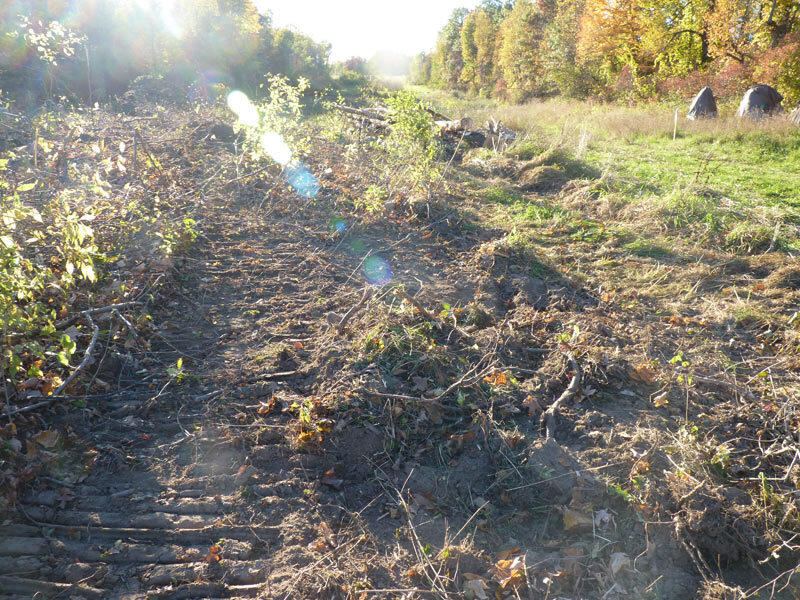 A few months ago, we got the word that Enbridge would be clearing the trees near the existing pipeline–about 80 or so feet of trees, 4 acres long. 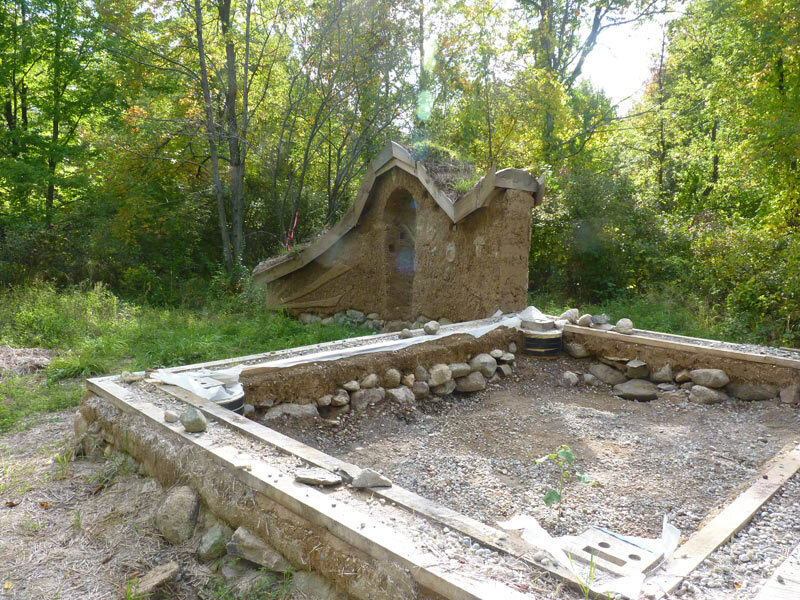 They also required Deanne to dismantle one of the natural buildings that was nearly finished–it was an amazing, quirky guest house. I hate to think how many thousands of hours of labor went into building that guest house. 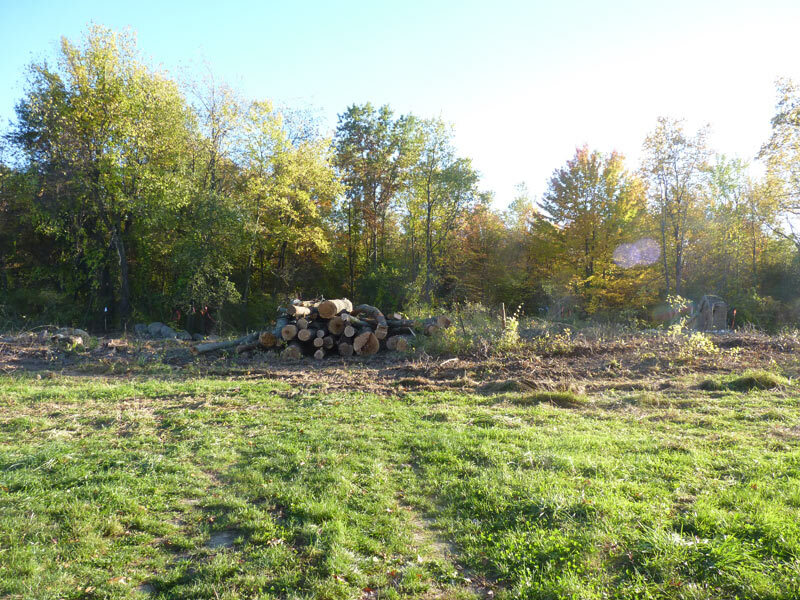 A few weeks ago, Deanne got word that the tree clearing would be occurring at a rate of 1 mile per day, and that it would be occurring soon at Strawbale Studio. 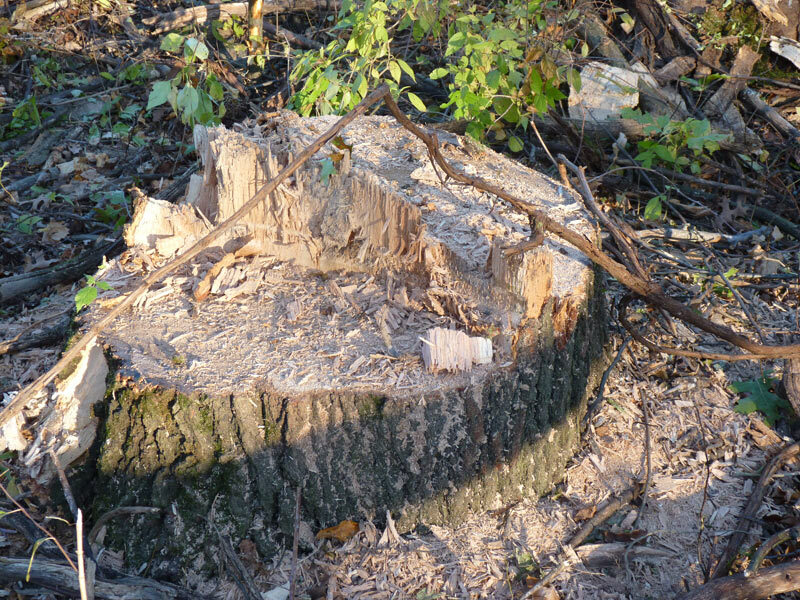 I went out to the property to honor the trees and document what was occurring before the crews were to come through. 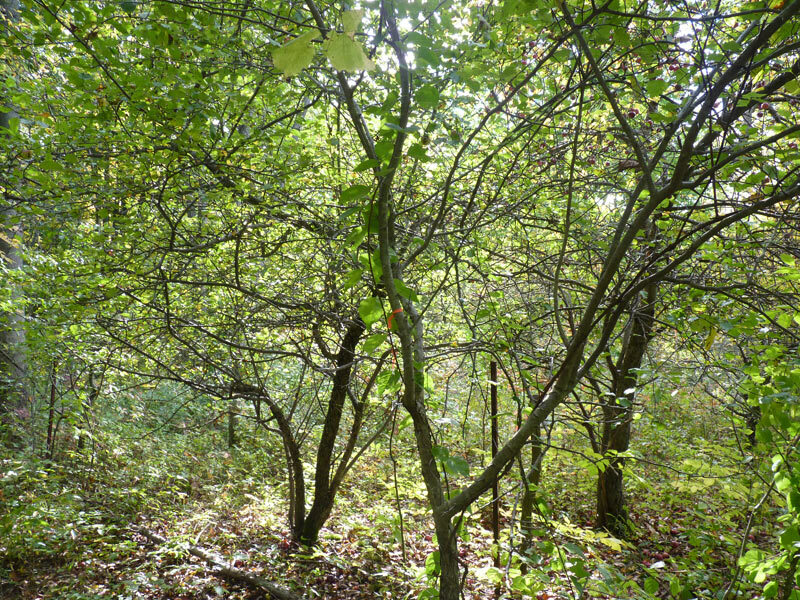 Here are some photos of this patch of lovely forest, thick with many kinds of sacred trees and plants: hawthorn, apple, oak, maple, cherry, brambles, and so much more. I must say, that this was one of the hardest visits I ever had made to a forest. Why? Because I knew it was doomed and had no hope of survival. Nothing that any of us could do would permanently stop the great wave of oil that would wash through its path. The trees knew it was coming and had already accepted their fate with a dignity that few humans can ever achieve. They waved at me in the gentle breeze, knowing that they were experiencing their last sunsets, their last ever fall equinox. 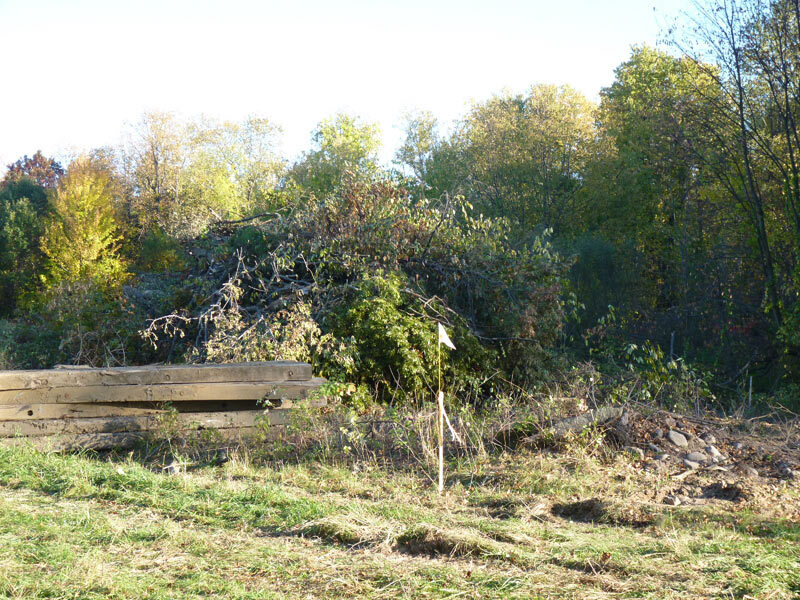 When I arrived, I immediately noticed that the workers, in marking up their areas for clearing, had knocked over a small living hawthorn tree, a very sacred tree; we gathered up the berries and will dry them and use them this winter. There is another part to this visit though, the darker part. This visit was also very hard because I drove there, using fossil fuels that very well could have been extracted and sent down that same pipeline, and I was contributing to the problem even in order to make my visit. The contradictions were rooted deep within me as I spent time there with the trees. I’ve been seriously reading on how to reduce my dependence on fossil fuels in an efficient and cost-effective way, but I haven’t yet come up with a solution that I can afford and enact. So knowing that I was using the oil that is driving this project was particularly difficult. Where do we go from here? There are ways to be reactive to what is happening and there are ways to be proactive. This is not just the story just of destruction. I’ll continue to document what is happening at Strawbale Studio, and talk to some of the people there about the “clash of worldviews” as I am calling it; the sustainable living skills that are attempting to be taught while the heavy machinery rolls ever onward and oil pipeline is built within earshot of our workshops. What this story will hopefully be, however, is a story of what we do with this space after they clear out. 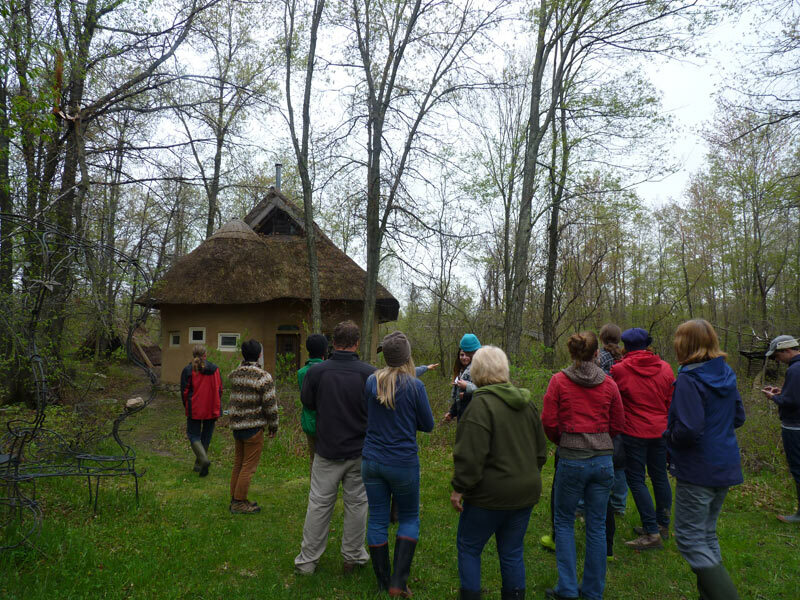 How this space is transformed into something new; how the wood is used, how the land is regrown, and how we all grow in the process. As they continue to put this pipeline in for the next year or so–and as we brainstorm our next moves in producing something amazing in this space that has now seen such suffering. I hope you’ll follow us and see what happens next.